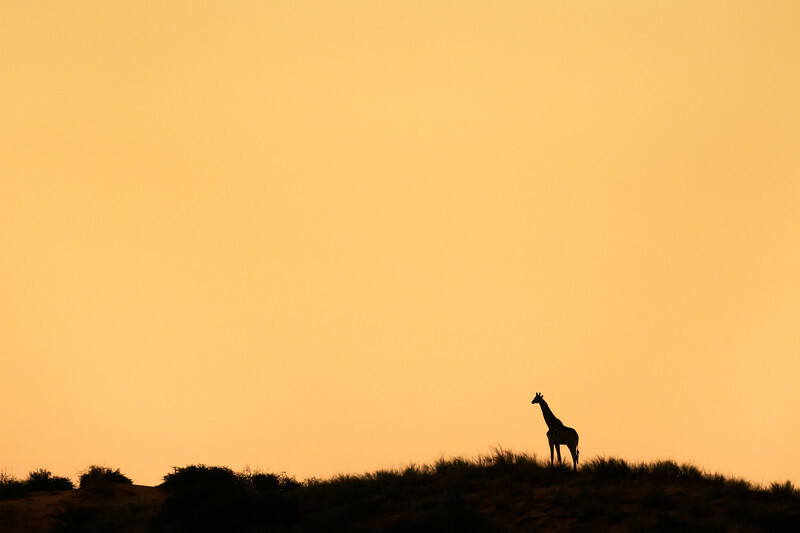 Giraffe Silhouette, Kgalagadi Transfrontier Park, South Africa. Giraffe are not a subject you expect to find in an arid region with few trees and for a long time they were absent from the Kgalagadi Transfrontier Park of South Africa, having been hunted to extinction. In the 1990's they were reintroduced and have been thriving. They can normally be found in the dry river beds where the large trees are but more and more they can be seen on the tops of the dunes at sunrise and sunset. Perhaps they just enjoy watching the sun rise and set.